These messages come in two flavours: they can be queries or commands. A query message returns something and changes nothing. A command returns nothing and changes something. The problem is, we conflate commands and queries. (e.g. pop method). It is not evil per se to mix command and query methods, but they get tested differently. The diameter method is an incoming query. 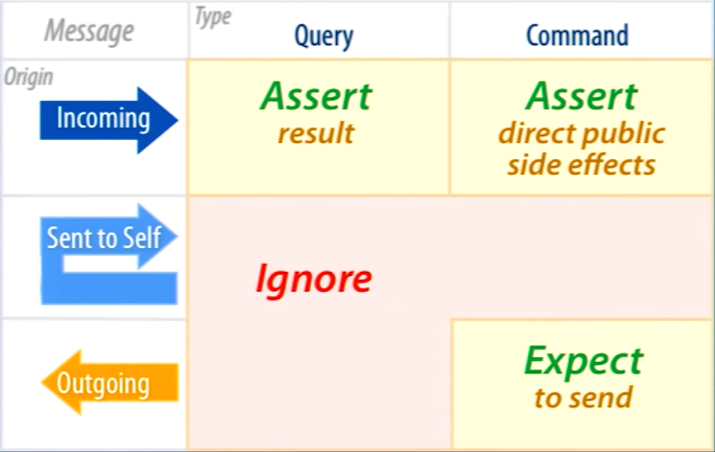 Rule: Test incoming query messages by making assertions about what they send back (i.e. their state). We don’t care about how it’s done. We care only about the message that is sent back. We test only the interface, not the implementation. That means we can change the implementation without breaking the tests. The set_cog method is a combination of a query and a command. It returns a value - that’s the query part - that gets set on the @cog instance variable - that’s the command part. Rule: Test incoming command messages by making assertions about direct public side effects. The receiver of the incoming message has sole responsibility making assertions about its value. Rule: Do not test private methods. Do not make assertions about their result. Do not expect to send them. Writing tests for private methods binds us to a specific implementation and make it impossible to refactor without breaking the tests. It’s an overspecification that adds costs, and absolutely no value. Rule: Do not test outgoing query messages. Do not make assertions about their result. Do not expect to send them. If a sent message has no visible side-effect, then the sender should not test it. Test outgoing command messages by setting expectations on them, expecting that you send them.